KBOgroup began their partnership with Fiserv, a financial services data company, in 2008. Fiserv produces a biannual client conference which is attended by banking and credit union C-level executives and managers. 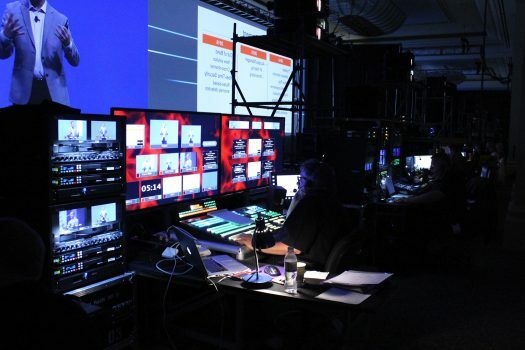 KBOgroup collaborated on designing one of the first wide-screen video backgrounds for conferences, encompassing a 220’ x 20’ projection wall in the infancy of that technology. The roster of speakers we have worked with for the conference includes presidents Clinton and Bush, Condoleeza Rice, Magic Johnson, and Colin Powell. Our entertainers include Earth Wind and Fire, Hall and Oates, and Sherryl Crow. One of the highlights of each forum is a session exclusively for CEO’s of mid level banks and credit unions. Forum 2017 is pre-production is underway for the Venetian in Las Vegas in April.